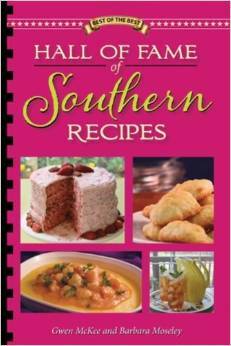 If you love food from the south then this is the cookbook for you! The editors, Gwen McKee and Barbara Moseley, are natives of Mississippi and Louisiana. Naturally, their search to find the best recipes in the United States began in the south. From their travels, research, and own personal experience, they collected over 8,000 recipes from the southern United States alone! After sifting through 8,000 recipes, this cookbook highlights 212 of the recipes that they felt best captured the flavors, history, and spirit of the south. Specifically, this cookbook contains recipes from Arkansas to Virginia, an eleven state region. Just like their other Hall of Fame cookbooks this cookbook has a little bit of everything from appetizers to main dishes and desserts. Each recipe is easy to read and tells the state and cookbook where it originated. With recipes like Hot Cheesy Black-Eyed Pea Dip, Savannah Cheese Grits with Breakfast Shrimp, Grilled Kentucky Bourbon Beef Tenderloin, Fried Green Tomato Casserole, and Chicken “n” Dumplings, you're sure to get your southern fix! Personally, I can't wait to try the White Chocolate and Lime Mousse Cake. Is your mouth watering yet? !